Dimension: Ganesha- H-2.5 Inches, Chowki- 4 x 4 Inches Approx. Shree Yantra, an embodiment of Goddess Mahalaxmi, known as the bestower of Prosperity. But the Prosperity unaccompanied by the Knowledge/wisdom, may prove futile and fatal for the possessor. Considering this divine aspect, combination of Lord Ganesha and Sphatik shree yantra becomes the perfect divine duo to bless our life with name,fame peace & prosperity. Lord Ganesha, is known as the God of education, knowledge & wisdom, literature, fine arts and the destroyer of evils and obstacles in life. Having an image of Lord Ganesha &shree yantra in one’s home or place of work / study and gifting or accepting a gift of an image of Lord Ganesha is considered auspicious. The real charm of objectifying God - the supernatural - lies in representing it through Natural means only. From the day one, Marble is considered one of the purest materials to be used in devotional sphere. 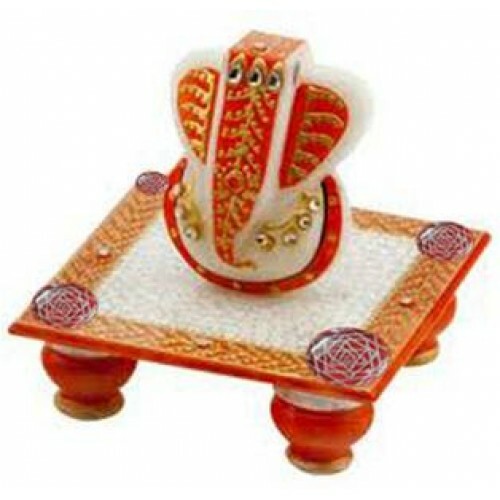 Following the Age old proven tradition, with the grace of God, we are offering you the Mystifying Marble Ganesha, sitting on Chowki/seat adorned with four Sphatik / Quartz crystal Shree Yantras. Such a simplified perfect finish of Lord Ganesha is rare in marble craftsmanship.